Sick twice in the last 2 months. Mechanic stripped the oil plug on my daily driver causing oil to leak all over my driveway. While replacing a toilet in the bathroom I dropped a bolt down the drain. And the boot to the groin? Jury duty for the next month-and-a-half! Okay, once you write it down it isn't so bad. Come on February! 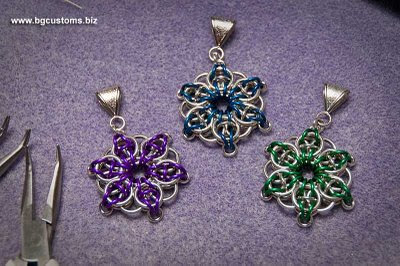 So this week I learned a new chainmaille pattern called "Celtic Visions Star." It's not too hard and by using anodized aluminum we can create all sorts of colors as well as keep the prices down. These pendants, as well as all the other jewelry we make, can be purchased at our booth (BG Customs) most Sundays during the Jefferson Biz Market just off Route 9 near Charles Town, WV in the Mountain Community Center (MCC).